Student Refuses To Say “Racist” Pledge Of Allegiance & Threatens Teacher. District Responds By Firing Teacher. A substitute teacher (who also happens to be a Cuban-American) was going about normal start of the day business by having the class recite the Pledge of Allegiance. 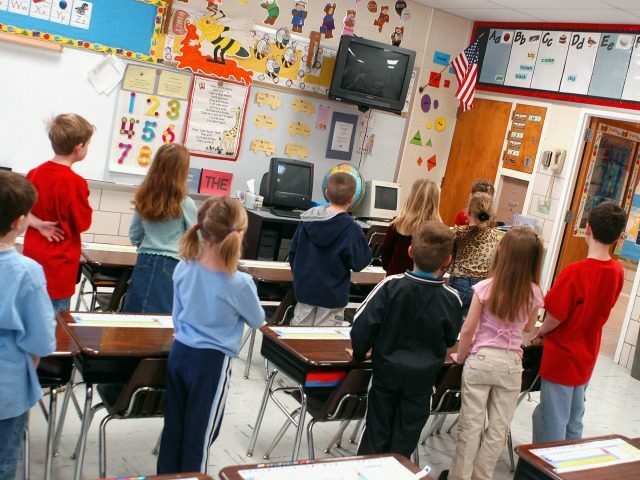 One 11-year old student refused, saying the pledge was racist. The student is said to have then threatened to beat the teacher and called the entire school racist. Fast-forward 72 hours. The student’s mother saddles up with legal help from a nonprofit group and the substitute teacher is fired. Welcome to American education circa 2019. An 11-year-old Florida student was arrested for allegedly threatening to beat his teacher because he refused to recite the Pledge of Allegiance, calling the pledge “racist” to black people. The alleged incident began when a substitute teacher asked the student to stand for the pledge. The student, who usually does not stand for the pledge, replied that he would not participate in the Pledge of Allegiance because he believed the American flag is racist and the national anthem is offensive towards black people. “They brought me here,” the boy reportedly replied. “Well you can always go back, because I came here from Cuba and the day I feel I’m not welcome here anymore I would find another place to live,” the teacher then reportedly answered, before calling in other school officials to deal with the student. Things escalated when the boy allegedly refused to follow school officials’ orders, called them racists, threatened to beat the teacher and get the school officials fired, according to the arrest affidavit. According to the school’s student handbook, students can opt out of the pledge with written permission from a parent or guardian. But a spokesperson for the school said the substitute teacher was not aware of the policy. The district also told the substitute teacher she could no longer work at any schools within the district.